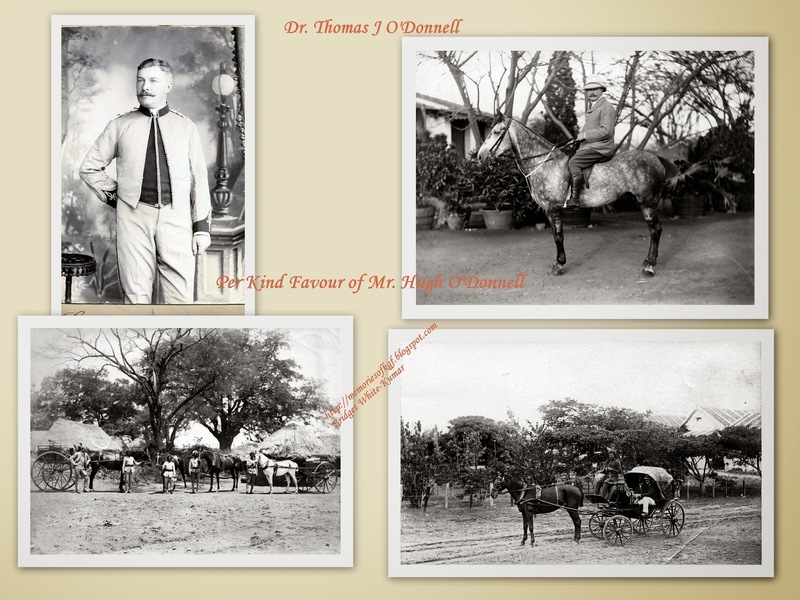 I am the grandson of the famous Dr O'Donnell who founded the Kolar Hospital. 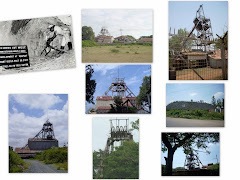 I am sending you a few photos and memorabilia in a download link. I have a copy of your book. If any of the photos are of interest you may use them on your website. 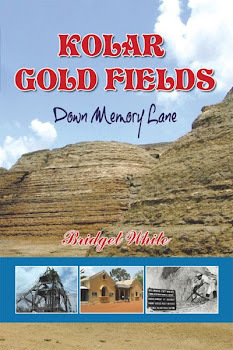 One day I hope to visit Kolar myself and walk on O'Donnell Road, if it is still there. 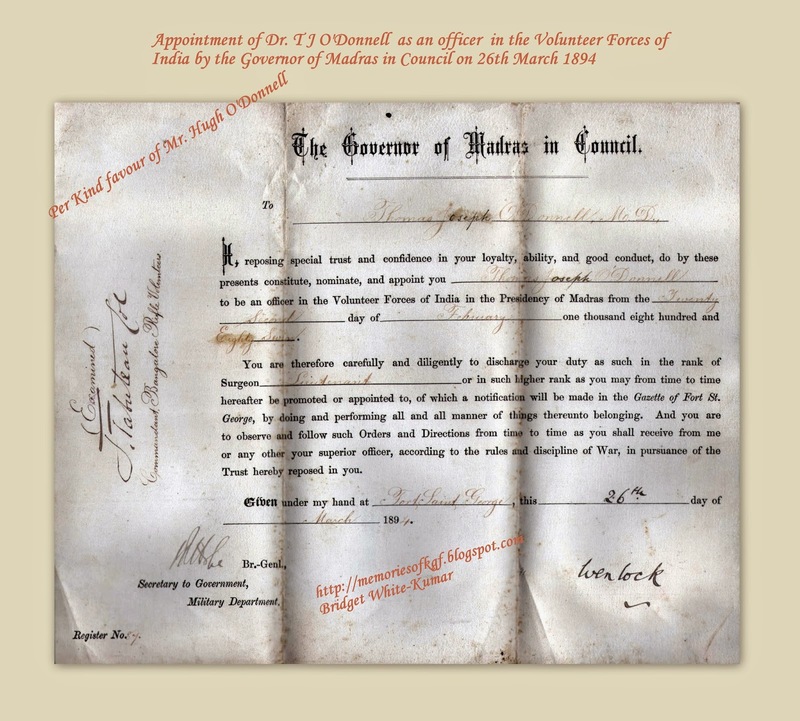 I should explain that my father Godfrey O'Donnell, the second son of Thomas O'Donnell, had a second marriage later in his life (after the death of his first wife), and I was born when he was in his sixties! 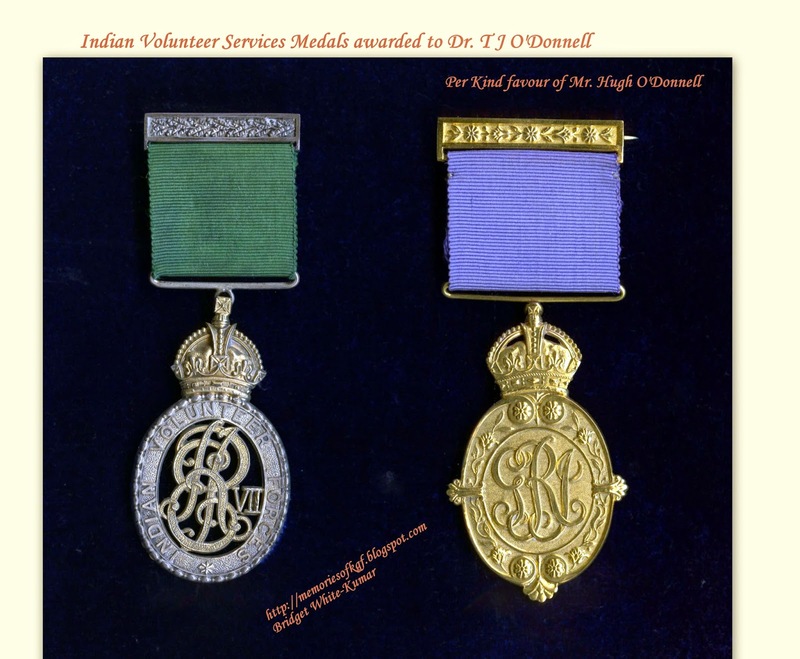 Sadly I never knew the great Dr O'Donnell in person, but am thrilled to discover the contribution he made to the people of Kolar. 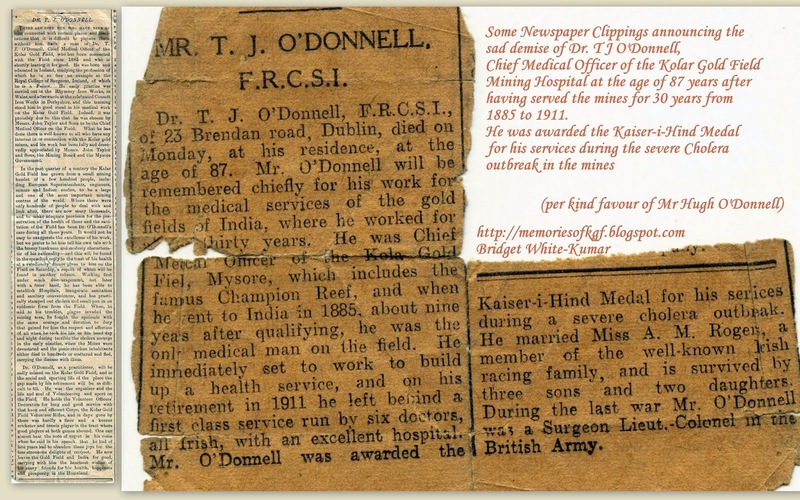 Dr.. T J O’Donnell was born and educated in Ireland. He qualified as a surgeon from the Royal College of Surgeons in Ireland where he became a ‘Fellow’. 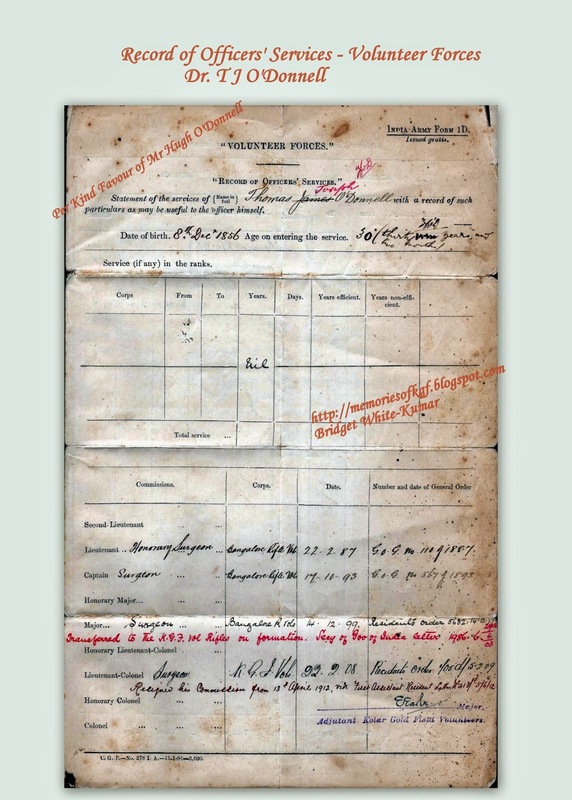 He started working as a doctor at the Rhymney Iron Works in Wales and after a few years he joined the Consett Iron Works in Derbyshire. 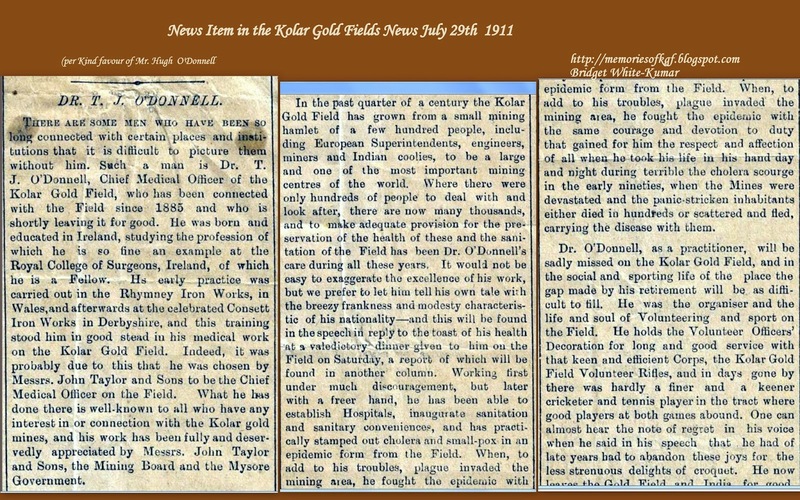 In 1885, he was contracted by the John Taylor and Sons Company to set up a health service in the Gold Fields. He was the only Medical Personnel at the time and a clinic was set up for him in a Bungalow near Marikuppam. He immediately went to work to set up a good health and sanitation system. 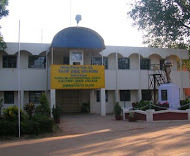 In 1887 the John Taylor and Company established a small hospital to accommodate 48 patients initially . It was centrally located in Champion Reefs and Dr. T J O’Donnell was appointed as the Chief Medical Officer. He was later joined by his brother Dr.J D O’Donnell. More Medical staff were appointed and by the year 1900, this Mining Hospital became a well equipped hospital, to cater to the medical needs and emergencies of the miners and their families. 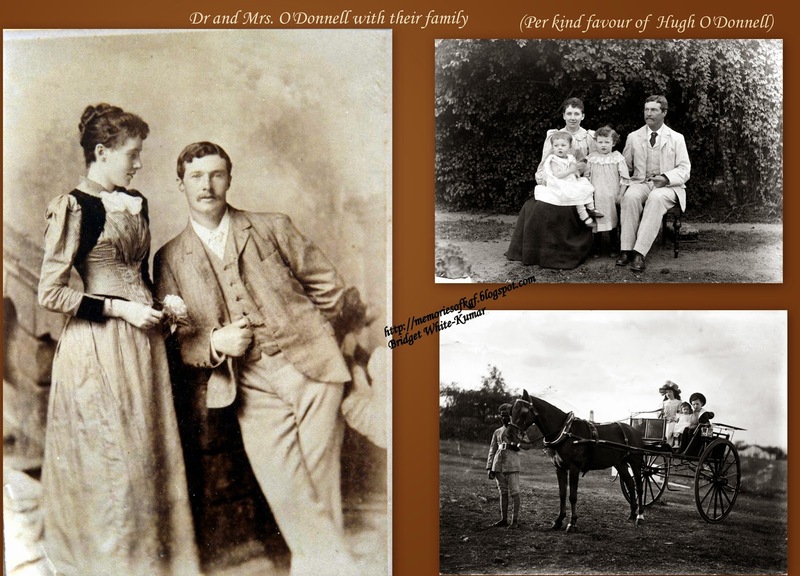 He served as the Chief Medical Officer for more than 35 years and when he retired in 1911 to return to Ireland, he left behind a first class medical hospital service run by the 6 Irish Doctors specially trained by him. 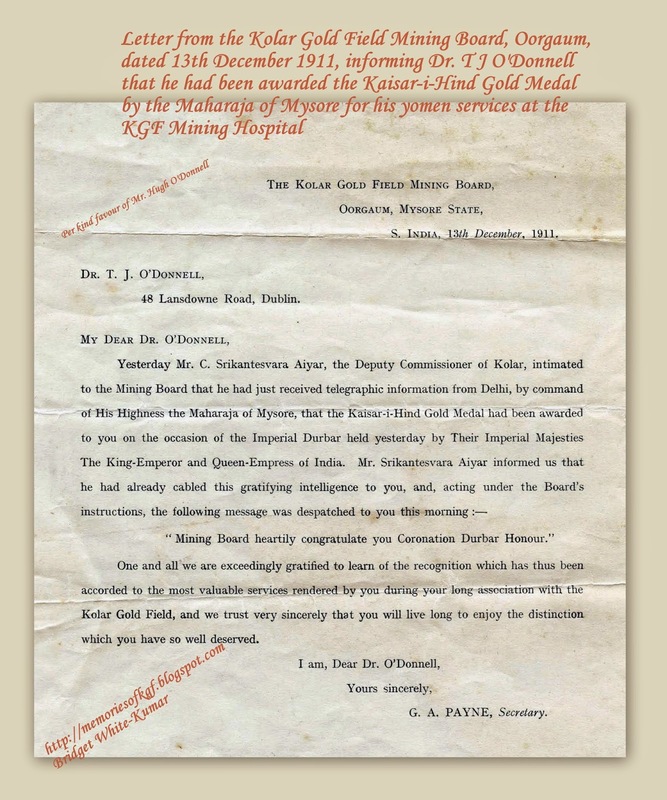 He was awarded the Kaiser-i-Hind Medal by the Maharaja of Mysore in recognition of his services in the medical field and especially during the severe Cholera and Plague outbreak in early 1900. He passed away at the age of 87 at his residence at Dublin Ireland.